It’s cute. Got it for my 5 year old. The shoulder straps were a little loose so she didn’t like to wear it as much. It isn’t as poofy as the picture but close enough. Still cute. Color is not to much different than the picture. 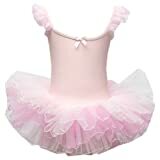 This was a great tutu for my 6 year old daughter. The straps were too long and thus, the whole front of the leotard dipped down too far for my daughter to be comfortable wearing it. Thankfully, my mother can sew, so she doubled up the straps and sewed them in place. My daughter feels like a beautiful ballerina in this tutu and I foresee many impromptu dance recitals in my future.